» Woolrich vs Canada Goose Jackets – Which Will You Love? One of the most intense and challenging clothing purchases that you will have to make is picking out the perfect jacket. When winter months are the concern, you want something that is going to protect you from the elements and keep you warm. In addition, since jackets can cost quite a bit of money, you will want a jacket that is going to last for a considerable amount of time. By finding a great jacket that is going to last, you increase the value and purchasing something that might cost a little more upfront can have huge cost benefits in the long run. Woolrich and Canada Goose jackets are often compared because both brands have an international following and cult-like following. They are both known for their superior take on cold weather gear and both of these brands are from North America. They both are very popular and both have been able to break into the international market which makes them stand out when compared to other brands. Of course, you are probably wondering which of these brands produces a better jacket and which one is going to best work for your needs. Our guide is designed to give you the information that you need and help you to be able to make an informed purchase. We will go through each of the brands while highlighting some of our favorite jackets and features. Then we will give you our own personal opinions about which jackets we think will work better. Woolrich is an American company that has been around for generations, making them one of the oldest manufacturers in the United States. In fact, they have been making clothing for almost two hundred years. The company has been involved in some of the biggest wool clothing trends. They started producing wool basics and eventually introduced the still popular buffalo plaid design. Today you can see buffalo plaid everywhere. Even the trendiest boutiques and stores have buffalo plaid. However, most people do not realize that the design was introduced by Woolrich or that it is a design that at one time was unique and only sold at Woolrich. This rich plaid textile is one that does not seem to be losing popularity anytime soon and if you are someone who keeps up with the trends then it is probably something that you have in your closet today. Woolrich was first introduced in 1830. The company was started when John Rich built the first woolen mill in Plum Run, PA. He was an immigrant from England and would take his woolen wears to different camps so that he could sell them. One of the problems that he faced was that in Plum Run there was no flowing water all of the time which caused some problems. Then in 1845, John built a second mill at Chatham Run. Here he was able to take advantage of the steady flow of water. It was in 1850 that the famous buffalo plaid was first introduced. From 1860 to 1861 Woolrich actually supplied the union soldiers during the Civil War with blankets. These are actually the same blankets that are still made at the mill today. In 1880 Woolrich started making clothing that was geared to leisure time. Prior to 1900, most people did not have leisure time, but around 1900 even the people who had low-level jobs were able to enjoy their leisure time and spend time in the great outdoors. The railroad vest, which you can still purchase today, was introduced in 1901. It was originally manufactured with railroad workers in mind and the signature four pockets each had a purpose with the duties that they had to perform. Later in 1901, a fire took out most of the Woolrich mill. The company was able to rebuild and from 1914 until 1917 they again provided the military with their wool blankets. In 1939, Woolrich started outfitting the Antarctic explorers. In 1942 the company started manufacturing blankets for the war again. However, this time they were also making clothing for the soldiers. In 1956 America passed the Interstate Highway Act which led to more individuals and families traveling around the United States so more leisure clothing was introduced and purchased. In 1969 the company started introducing the high-end wool shirts and other products and has continued to grow and introduce more products since. Woolrich is a brand that uses many different fabrics. However, they are mostly known for their clothing that is made from woolen fabrics. One of the things that makes the fabrics unique is that they are made into rich colors that you cannot find with any other brand on the market today. The company offers a lot of unique fabrics and they have been made in different weights from a lightweight to a heavyweight. The heavyweight fabric is what is used in the jackets that Woolrich makes for the winter months. One of the things that the company uses when manufacturing jackets is a special Ramar fabric. This fabric is known for being both weatherproof and durable. It is a special fabric that is made from a blend of 60% cotton and 40% nylon. This makes it stain resistant and water resistant while helping it be durable enough to last for many years to come. The jackets are lined with polyester. They have a shell that is treated with Teflon. This gives the jackets extra resistance to things and helps them to last longer. This is something that you should note because it means that your jacket is going to last a long time and is going to be high in quality which you might not see with other jackets. The manufacturing process applies details that are not seen with other brands and this is part of the reason that you can rest assured when you purchase a jacket from Woolrich that it is really going to last you for a long time and still be in use for years to come. There are different types of insulation that are used by Woolrich in their products. Depending on what type of products you are looking at the insulation could be natural or it could be synthetic. They use both synthetic down and natural down for the insulation in the jackets. The fur on the hoods of the parkas comes from coyotes. The company makes a wide range of jackets that are very versatile. This allows for you to find the jacket that you need for any type of weather that you might be faced with. Woolrich has an exciting line of jackets for men that range from those which are lightweight and perfect for warmer months to those that are heavyweight and perfect for the coldest months. The iconic arctic parka is the jacket that is going to ensure that you stay warm all winter long. It is available in thirteen different colors and in sizes that range from extra small to extra large. The jacket is insulated with down and is wind proof, rain proof, and stain proof which means that you are able to ensure that it is going to look great for years to come. The jacket has a two-way full-length zipper closure with a button closure for over that. It also features two upper hands warmer pockets and two lower button pockets to ensure that you can keep things protected and your hands warm at the same time. The Dorrington II Barn Vest is an updated version of the original vest that has been used for many years. 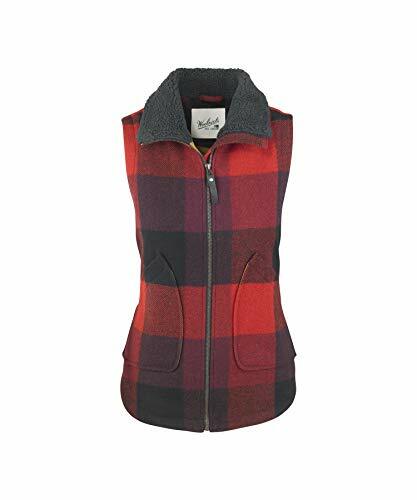 This vest is made from a high-quality cotton twill on the outside and has a warm blanket fleece on the inside. It is perfect for those days when you need a little something to keep you warm. It has a nice functional security pocket and hands warmer pockets. The internal pocket features a zipper to help keep your items secure and safe. It also features a center zipper front design which helps your body to stay insulated while you are wearing it. 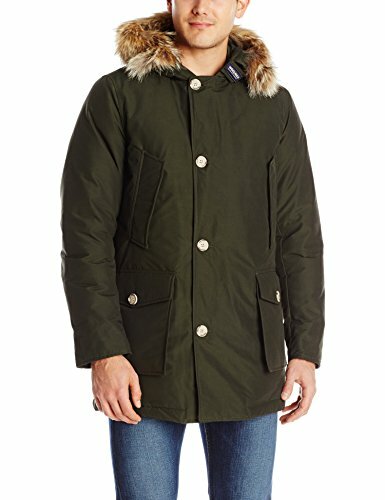 The Men’s Bitter Chill Wool Loft Jacket is a comfortable and warm jacket that is made from the iconic Woolrich wool. One of the things that makes this jacket unique is just how warm it is. In addition to the warmth, it is waterproof and breathable. The fact that it is breathable is what makes it so unique and such a popular choice. If you have ever been active in the winter months only to find yourself sweating inside your coat, but not able to take your coat off you will understand just why this coat is a perfect choice. Woolrich has a unique line of products that are available for men. They offer pants, shoes, shirts, accessories, and bags. If you are a fan of the Woolrich brand there are many more items that you can consider purchasing. Woolrich also offers a great line of products for women. Their jackets are known for offering women style and comfort while also giving them everything that they need to stay warm all winter long. There are jackets that are available for a wide range of different temperatures and types of weather. The Women’s Military Down Parka is one of the best jackets that you can buy if you want to make sure that you are going to have a jacket that will keep you warm in the coldest conditions while also having something that is going to last for years to come. This jacket comes in four stylish colors and sizes extra small to extra large. It is made with so many specific details in mind including that it be weather and waterproof. It has rib knit cuffs that help to keep things warmer and keep cold breezes from blowing in. On top of having pockets on the outside, there are also two large inside pockets so you can keep things safe. The Women’s Giant Buffalo Wool Vest II is a high-quality vest that is going to keep you warm in the winter months. This vest offers you two different color choices and the chance to stay warm all winter long. 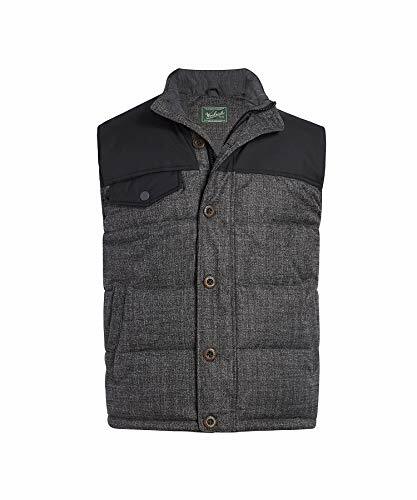 This vest has a wool outer shell and a nice high-quality fleece inner. It is a vest that is going to keep you warm and help you to avoid all of the weather that you might be faced with. It is perfect for cool mornings and whether that heats up because it is portable and easy for you to stay warm. The Women’s Mackenzie Check Parka is a favorite among women of all ages. The jacket has cute iconic style with a modern twist thanks to the popular (but old) buffalo plaid print. It is a high-level jacket that is warm. This parka is insulated with 100% Thermore Ecodown and 100% recycled polyester made from the recycled water bottles. These both help you to stay warm. The jacket has a two-way full-length zipper closure and then a snap cover that goes over the zipper closure. It has a hood that is trimmed in removable fox fur as well. Woolrich is a full line brand that offers more than just jackets. The women’s line features shirts, pants, jackets, accessories, skirts, shoes, and bags. Their products offer a great line of clothing that is perfect for use in the outdoors as well as for a variety of different purposes. Having the ability to wear these clothes when you are traveling is also great as most of them are easily packable and perfect for traveling. This makes them a top choice of those who travel for work or leisure. Woolrich products are made in the United States. Woolrich products are made to last for a long time. Woolrich products use the best materials and high-quality products that will be manufactured into their pieces. Details matter when it comes to the iconic style that you see with Woolrich jackets. Jackets are available in a wide range of colors and designs. Woolrich products are a great value and will offer you the chance to have a great quality item. Weatherproof jackets mean that you never have to worry about getting wet or having the wind cut through your jacket again. Jackets are made to withstand all of the elements, but will still allow you to breathe no matter how active you are. The Woolrich line of products are not cheap and some items are very expensive, even when compared to similar brands. There is no line of Woolrich jackets for children which means that you cannot purchase the line for your entire products. While the name Woolrich would lead you to believe that all items are made from wool, many of the products do not use wool at all. Almost all of the products are going to be dry clean only so having your clothes cleaned can become an added expense that you might not be expecting. Canada Goose has a large line of jackets with lots to choose from. The most popular jacket that Canada Goose produces is the Expedition Parka. This jacket is actually available in both men and women’s styles. The jacket is an iconic trademark of the brand and when you first think of Canada Goose, this is likely to be the jacket that comes to mind. We will give you all of the details of the jacket and share more with you later, but we felt that it was important to help bring to mind the brand when we were talking about Canada Goose. This brand is known for being able to keep you warm in the coldest conditions and one of the reasons that the brand is so popular is that it delivers on this very promise. Canada Goose is a newer company that was founded less than sixty years ago. The company was first started in a small warehouse in Toronto. While the company has humble beginnings, they have grown to be an industry leader in outerwear. In 1957 Sam Tick immigrated to Canada and founded Metro Sportswear, LTD. He specialized in woolen vests, snowmobile suits, and raincoats. The company remained the same until the 1970s during which time Sam Tick’s son in law, David Reiss joined the company. David wanted to help the company to expand and introduced Sam to new innovative technology with a volume based down filling machine. During this time David also started a new name for the company calling it Snow Goose. Later the name changed to Canada Goose. It was in the 1980s when scientists who were working in Antarctica’s McMurdo Station were having a hard time staying warm. Due to this, the company developed a special jacket that was meant to keep the men warm and eventually became the standard issued jacket for these conditions. This jacket was the first version of the famous Expedition Parka. 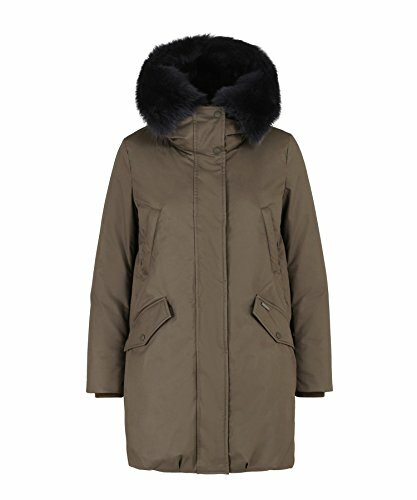 Since the parka was introduced and came onto the scene, it has been a popular choice and has continually increased in popularity. It has even be worn by climbers and athletes who are performing in extreme conditions. Plus, it has been seen in popular films and become a celebrity favorite. This leads us to today where the jacket has gained a cult following and continues to outperform most other jackets that are available. Canada Goose is one of the most expensive brands of jackets that you can find. This is definitely one of those brands that actually offered more with a higher price tag. Instead of just giving you what you would typically expect from a jacket, you get a jacket that is considerably better than other jackets that are available. Once you are able to understand more about the materials and the manufacturer, you are able to fully understand why these jackets sell for such a high price. The manufacturing process actually goes through an unheard of thirteen steps. This means that a lot more attention to detail and work goes into each jacket than what you would expect or see with other brands. In addition, it is important to note that the products go through a thorough testing phase before new products are released. The company is committed to quality and instead of releasing something that does not meet their high standards, they discard it and start over. This is part of the reason that while the company develops new products, it does not constantly release new products into the market as many other brands do. On top of the fact that the company puts a lot of work into each of the garments, there is the fact that the company uses only top quality materials during the manufacture of its products. There are three different types of materials that are used in the manufacture of jackets. There is the actual fabric, the insulation, and the fur. One thing that sets Canada Goose apart from other brands is that they have actually created their own unique fabrics to be used in their jackets. The fabrics that are used are weatherproof and durable. They are called Feather Light-Us and Dura Force. These fabrics cannot be found with any other brand since Canada Goose actually developed them both with their own jackets in mind. Simply by the name, you probably can guess exactly what the insulation is made out of. The jackets are filled with 100% goose down. However, you might not already know that there are actually two different types of goose down. The type that Canada Goose uses is ethically sourced and traceable. The birds are never force-fed or hand plucked, instead the company only sources from goose farmers who guarantee that the feathers are naturally harvested after they have fallen out on their own as the geese shed. Finally, the fur that is used comes from coyotes. One might think that this is harmful to the animals. However, the coyotes that are hunted are in the southern part of Canada and the northern regions of the United States. In these regions, coyotes are considered pests and cause a lot of problems for the populations living in the area. By sourcing the fur from here, the company is able to help reduce the problems that the people face because of these coyotes being in their area. Canada Goose has been known for making high-quality jackets that are going to keep you warm regardless of the temperatures around you. These jackets are actually used by those in the Arctic and are known for the high-quality standards and attention to details that cannot be seen with jackets from other brands. In addition, you never have to worry about how the product materials are sourced as Canada Goose maintains a dedication to be ethical in its sources. The Men’s Chateau Parka Fusion Fit is one of the styles that will look familiar if you are familiar with the Canada Goose brand. This parka is an iconic and classic style and offers you a lot of warmth for a lightweight and comfortable jacket. The jackets come in sizes from extra small to extra large, this could be troublesome for those who are larger builds as they do not offer their jackets for those who are larger in size. There are many additional features that are there to ensure that you never get cold regardless of the weather or the conditions that you are faced with. The Men’s Garson Vest is a high-quality vest that is made for you to be comfortable. It comes in seven different colors and is available in sizes from extra small to extra large. It can be worn on its own, under a soft shell jacket, or even over a fleece jacket. This can all help you to stay warm so that you are comfortable regardless of the weather. Do keep in mind that this vest is dry clean only so you are not able to wash it unless you have it dry cleaned. You risk ruining it if you wash it at home. The Men’s Harbour Jacket is a jacket like no other jacket that you have seen before. This jacket is perfect for windy and rainy months. It is available in sizes small, medium, large, and extra large. The jacket is waterproof, durable, 4-way stretch, breathable, windproof, and durance laminated. This means that it has the superior technology that actually keeps you from having to worry about the rain and impact of the weather that you can have. It has a three-layer waterproof fabric. Canada Down differs from Woolrich in that they do not offer a full line of products. They have a line of jackets and coats, a line of knitwear to help provide base and mid-layers to keep warm, and accessories. Overall it is purely a brand that is devoted to keeping you warm in the winter months or in areas that often have a cold climate. 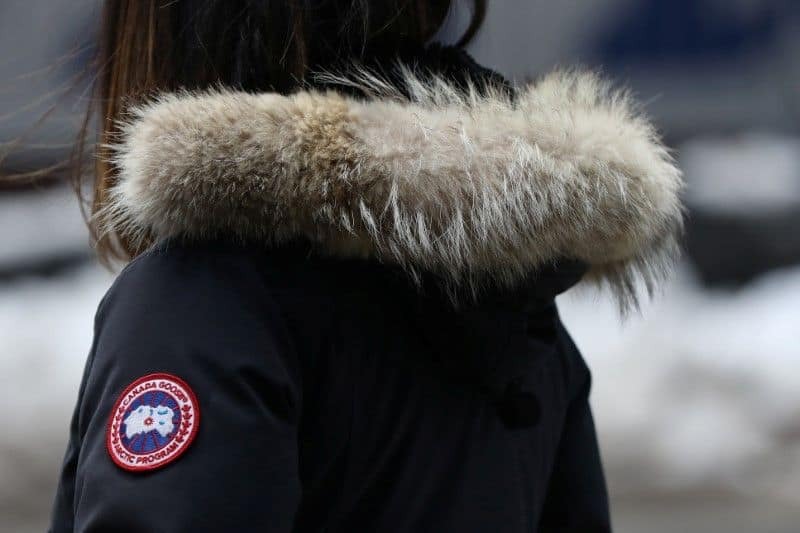 Canada Goose does not just produce products for men. They also have a full line of jackets for women. Their jackets for women marry iconic style with some of the features that women want when they are trying to stay warm. They are known for being smart and highly functional while offering the wearer a chance to stay warm in cold months. 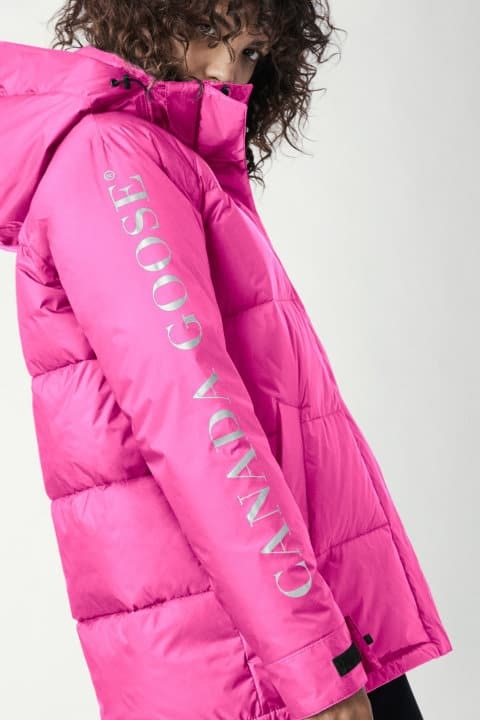 The Canada Goose Approach Jacket is a high-quality jacket that is an awesome choice for women who are interested in being able to have everything that they need. This jacket comes in seven bright and unique colors and is a style that you will love. It has a number of features that are going to help you to ensure that you can stay warm. Plus, you will find that there are a lot of special details that can keep you protected. It is available in sizes from extra small to large. The jacket is waterproof, durable, breathable, windproof, and lightweight. The Women’s Hybridge Light Vest is a high-quality vest that is going to keep you warm. It is perfect for wearing alone or layering to be able to keep you warmer than you would have been without it. You can purchase the vest in sizes extra small to extra large. It is a line for comfort and to be warm and comfortable at the same time. The Women’s Savona Bomber Jacket is a great choice for anyone who loves to be on trend with the current fashion trends. This jacket fits into the current bomber trend well but is not something that is purely cute to look at. It is a high-quality choice that is comfortable and something that you are going to enjoy wearing for years to come. It is a great choice for anyone who is looking to have a high-quality jacket that is sure to keep them warm all winter long. Plus, you will love how it looks with all of your outfits and how comfortable it is when you are moving and involved in winter sports or other adventures. There are several other types of items that you can purchase from Canada Goose, but like with the men’s line, they are all items that are meant to keep you warm in the cold winter months. The brand has jackets, gloves, hats, accessories, and knitwear that is designed to keep you warm. You will enjoy having products that keep you nice and toasty no matter what the conditions are in the world around you and Canada Goose will be sure to keep you warm. 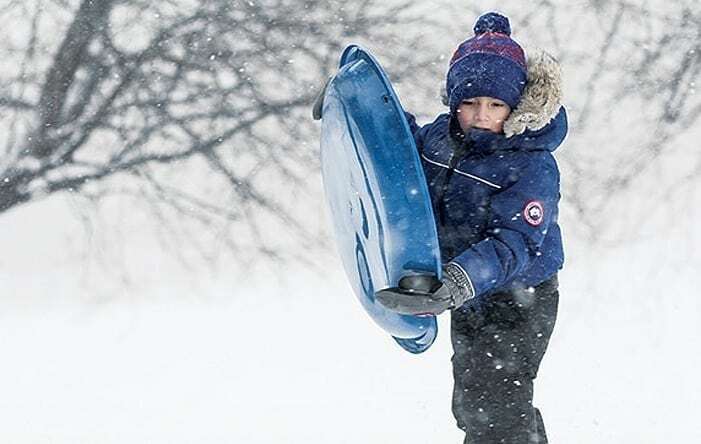 One thing that sets Canada Goose aside from Woolrich is that Canada Goose offers a full line of products for children. Their children’s products are offered to you with the same high-quality standards and attention to details that you have come to expect from the adult line. You can find outerwear and accessories for kids from infancy through adolescence. This means that you will have the ability to ensure that your kids stay warm no matter what the weather outside is doing. Canada Goose offers products that are designed with the entire family in mind. 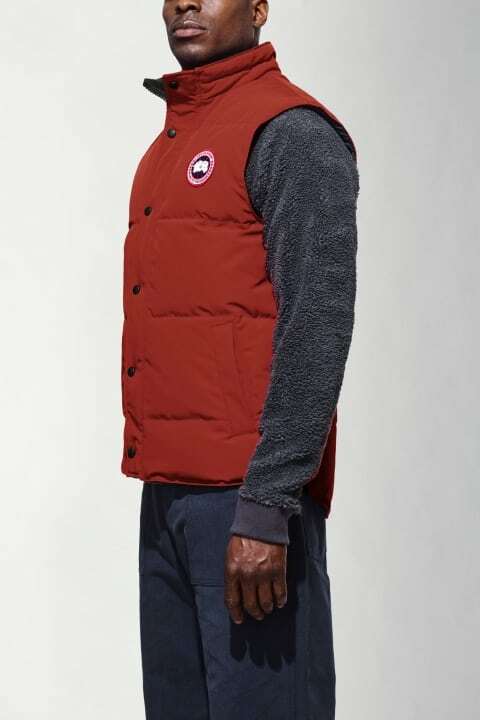 Canada Goose has a full line of jackets, knitwear, and accessories to keep adults warm. All materials used my Canada Goose are obtained ethically. Canada Goose puts tons of attention to detail into their products to ensure that you get something that is top quality. All Canada Goose products are designed with quality in mind first and then with the idea that you are able to look stylish and fashionable. They actually follow several current trends. Canada Goose products are very expensive. Many of the products do not come in a full range of sizes. The products all feature items that are obtained from animals. There are many things to consider when you are determining if a jacket from Woolrich or Canada Goose is going to work best for you. One of these is that the Canada Goose brand is not a company that caters to vegans or those who do not use animal products. Each one of their jackets features some type of animal product and the fill is never synthetic down. The quality is high, but so is the price. For a great jacket to stay warm in the winter Canada Goose is a great choice. Woolrich is another brand and the one that we find to be better for most people. They do not always use animal products and there are many jackets that are made without the use of animals. The products are high in quality and last a long time, but it is disappointing that they do not offer a line of children’s jackets when Canada Goose does. When it comes down to the facts, you can find a great high-quality jacket with either brand and our honest opinion is torn. Since I own one of each, I can say that I reach for Canada Goose more when we are going to be outdoors in cold temperatures. However, I almost wear a Woolrich jacket all the time, and I love it!